Seven years on from the January 25 uprising we uncover that the offshore company Pan World Investments, which should be compliant with EU freezing terms, has changed its registered agent after the Panama-based law firm Mossack Fonseca was fined for failing to identify Alaa Mubarak as the beneficial owner of the company. Pan World Investments was struck off the British Virgin Islands (BVI) companies list in 2016, leaving its assets in peril. The dissolution of Pan World violates sub-point “B” from the first subject in the EU freezing order, which forbids transfers, adjustments, usage or dealing in any way that makes changes to quantities, location, ownership, possession or its nature. Throughout his rule Mubarak controlled the judicial, legislative and executive powers. He maintained emergency law, allowing the government to arrest and detain citizens without charge. Mubarak and his clique, such as businessmen Hussein Salem and Ahmed Ezz, also monopolised strategic commodities such as steel, iron, and oil as well as seizing public land to make lucrative businesses. The ruling family owned stocks, shares and properties all over the country. Their influence extended to Cyprus and the United Kingdom. They possessed several offshore companies, and a number of luxurious houses and cars in Europe. Post January 25, figures determining the autocrat’s wealth have varied. The initial Swiss freeze covered roughly CFF 700 million ($700 million). Since 2011 this amount has been reduced to approximately CHF 430 million ($434 million) as a result of delisting members who have concluded reconciliation agreements with the Egyptian authorities. The Swiss authorities, as well as the European Union, both issued freezing orders on Mubarak’s assets in 2011, the former much faster than the latter. However, these measures were not enough to keep the dictator’s hands off his possessions being kept in tax havens. On 17 October 2011, only one day after the freezing decree, the British Virgin Islands’ authority published a warning statement stressing the vitality of respecting the European Commission’s freezing order which included 19 people including Mubarak and his associates. The Panama Papers leaks published in April 2016 revealed that Pan World Investments Inc was reactivated in 2013 in spite of the EU freeze order imposed on the BVI-based company. Pan World Investments Inc was registered 25 years ago in the British Virgin Islands taking the number 103684 in the local business registry. The company was activated by Credit Suisse Trust, which is based in Guernsey, while the Bahama-based company Primary Management Limited handled its management. Ties to Alaa Mubarak were not made until 2011, after the former President and a dozen of his associates and their spouses were investigated and asked to list their domestic and foreign assets. The investigation was part of the Domestic Illicit Gains Authority’s efforts to assess the legitimacy of Mubarak’s assets in response to complaint number 22 under illicit gains. Alaa was arrested and imprisoned after the revolution on corruption charges yet in 2013, despite its beneficial owner being behind bars, Pan World Investments Inc resumed its activity. The Panama Papers leaked correspondencebetween Mossack Fonseca and Credit Suisse that condemn both players. Credit Suisse has defended the reactivation of Pan World by stressing its obligation to maintain the company in good standing as it holds bankable assets. We are currently not aware of any order to liquidate and therefore we are under an obligation to ensure that the company is maintained in good standing as it holds assets. Mossack Fonseca was subjected to a $37,000 fine for due diligence failings as the company’s beneficial owner was subjected to freezing sanctions and undergoing criminal investigations in Egypt. On 1 August 2014 the law firm sent a letter to Primary Management giving them a 90-day resignation notice pursuant to section 93 (2) (9) of the 2004 BVI business companies act. They also forwarded their intent to Credit Suisse Channel Islands Limited in Guernsey on 24 August and asked them to notify the company’s directors at their earliest convenience. 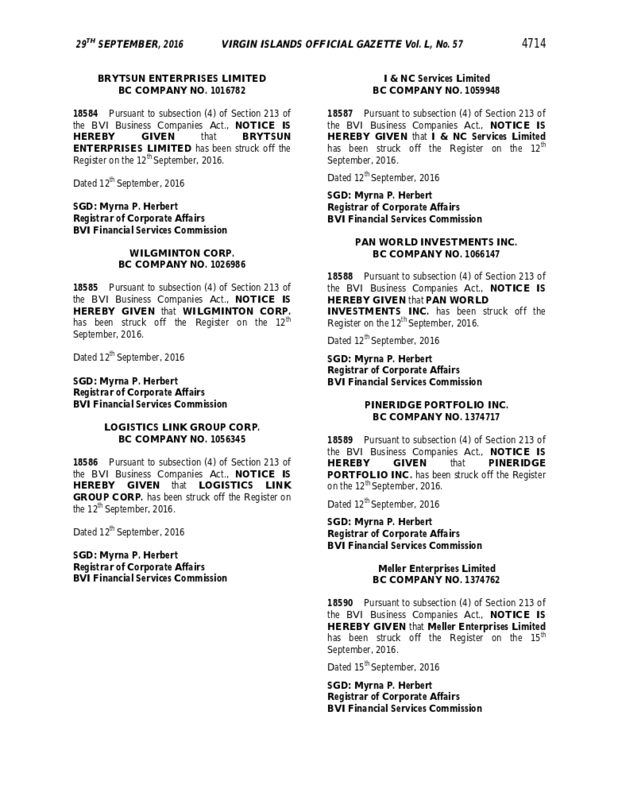 Soon enough, on exactly 15 April 2015, Mossack Fonseca was replaced by Icaza Gonzalez, another Panamanian law firm. We can assume that the new law firm resigned since an announcement was made in the BVI Official Gazette on 8 August 2017 warning Pan World Investments to hire a new registered agent within 30 days the company would be struck off. On the 12 September 2017 the company was struck off the business registry pursuant to subsection (4) of subject 213 of the BVI Business Companies Act. Our team has corresponded with the EU Commission under request number 1786 of 2018 to obtain further information regarding the fate of Pan World Investments Inc in coherence with documents access rights number 1786 of 2001. According to Bedell Cristin, a leading law firm on Jersey, only the BVI registrar of corporate affairs “the Registrar” can initiate the strike off. The main use of this procedure is to reduce the administrative and monitoring burdens on the Registrar from inactive companies. The companies still maintain their legal statuses after being struck off, however, they are then prohibited from dealing with their assets. Bedell Cristin states that it is unlikely that the Registrar will proceed to strike off a company if they have a reason to believe it’s still trading or has any assets. Has the ship sailed for these Egyptian assets? “Since 2011, the national prosecution has requested judicial cooperation with other countries to return the stolen assets by Mubarak and his associates,” Assem El-Gohary, former head of the Illicit Gains Authority told us. He then added that the Illicit Gains Authority has been relentlessly working on collecting evidence and clues that reinforce the illegitimate origins of those assets. The National Authority has taken drastic measures to ensure the recovery of those ill-obtained assets, collaborating with international offices to follow-up with all regulations and foreign investigations. Mubarak’s lawyer, Fareed El-Deeb, has refused to comment on Pan World Investment’s involuntary strike off on the basis that he is unfamiliar with the media outlets publishing this story. With Mubarak’s acquittal and the failure of the domestic and international Illicit Gains Authority to restore any of the country’s stolen assets, the dream of retrieving his assets is slipping away. Pan World Investments Inc was a crucial player in a spiral network of offshore companies belonging to Alaa and Gamal Mubarak. It acquired $250,000 in the “Horus 1” fund and a 10 per cent share in the “International Securities Fund”. This Cyprian fund is managed by Bullion, another Cyprian company owned by Alaa and Gamal Mubarak, which Pan World, too, had previously owned 5,000 shares in. Turquie : vers une épuration totale de la dissidence kurde ?